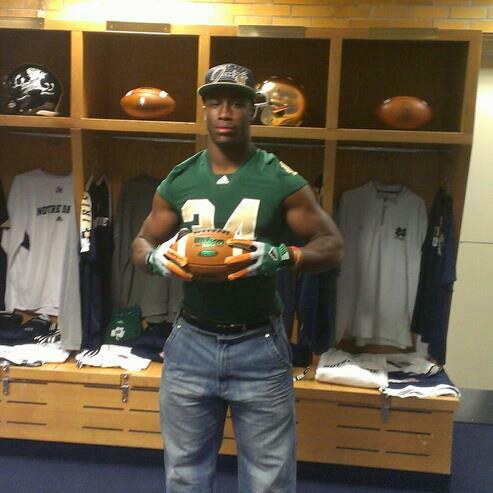 5-star commit, Elijah Hood, sporting Irish gear. Last year, Notre Dame brought in two big-time running backs from the south. This year, they added another: Elijah Hood. Watch film on him and you will quickly understand why he is a 5-star recruit and considered one of the best backs in the country. Off the field, he has taken over as the leader and top recruiter for the Golden Army ’14. Luckily, we had a chance to interview this charismatic commit about Notre Dame and the whole recruiting process. Jake: Elijah, thanks again for taking time out of your busy schedule to interview with us. We’ll dive right in. What were your best and worst experiences during the recruiting process? Hood: The best part was definitely the visits. Every visit was great because the colleges want you so badly that they try and make it as great of an experience as possible for you. At least all the schools I went to did a really good job. The worst part, though, is the recruiters constantly bugging you about your decision and when you’ll be narrowing it down and whatnot. Hood: Yeah, it gets really repetitive. Jake: Maybe you should’ve created the #RollToilet video a little earlier to get the message across sooner! **Next question is from fan, Trevor Leitz, who won our contest**: After you committed to the Notre Dame family, were you surprised by the amount of support you received from the fans? And did you receive anything negative from other fanbases? Hood: Yeah, my mom knew you guys were crazy about football up here, so I saw the love coming for sure. As far as negative feedback from other fanbases, not really. Maybe just some fake girlfriend jokes, but I mean, it’s Notre Dame…it doesn’t get any better! Elwood: Hell, even I get fake girlfriend jokes. She did make the Maxim Top 100 hottest women, though. Pretty good for someone who isn’t real. Fritz: Notre Dame fans are certainly one of a kind, that’s for sure. Anyway, since Coach Kelly has gotten to Notre Dame, he seems to be putting a big emphasis on recruiting in North Carolina. Do you feel like local opinion has changed for the Irish since so many players (Farley, Harrell, Okwara, Councell, yourself) are coming out of there? Hood: I see the influence in Charlotte because that is where most of us are from. But as a state, I’m not really sure they’ve reached the other parts yet. Elwood: Can’t comment on what you don’t know. I can definitely understand that. Charlotte puts out a lot of talent, so we’ll take it! Hood: I think if some of our guys from NC do well up there, people would definitely start noticing more. Jake: Most profiles have you listed at 5’11” 221lbs and running a 4.5. Would you say those are accurate numbers? Hood: I think I’ve lost like 3 pounds due to this southern heat, but yeah, everything else looks good, haha! Elwood: Bro, I’m from the deep south, so I feel you on that. Damn humidity! Jake: You’ll pack it back on easily during South Bend’s winters, though. Hood: At least I won’t be going to the hottest campus ever…Clemson! Elwood: Who at ND did you feel like you created the strongest bond with? And who in your recruiting class? Hood: The strongest bond definitely goes to Coach Alford. He is the man. I love that guy! As far as in my class: that’s a tough one, but I’m on really good terms with my man, Justin Brent, since rooming with him at the 5* Challenge. The dude is a beast, too! Elwood: Oh, for sure. He is definitely on the come-up as far as rankings go. Hood: For sure! I saw it live! He dominates! Must be all that basketball agility? Fritz: And Brent sure does love his Irish. I believe he recently got an ND tattoo! Hood: For real?!? That is so fire! I noticed he already had a nice collection going. Fritz: Yeah, he is pretty inked up. So, who is the best player you have seen thus far in the country after being at all those camps? Hood: Oh goodness. That’s way too hard to say. Everyone was amazing at doing their jobs. Hood: Man…all of them! They were all freaks. Jake: You seem to be very popular on twitter, and are very vocal about getting top-tier talent around you. Who are some of the guys you are trying to get on board? Hood: Basically anyone that’s interested and has an offer, we’ll go after. But, more specifically, we need WR and D-linemen the most. Hopefully Kizer can pull some, too. Elwood: Well, ND is definitely in it for a lot of top guys at those positions. Hood: We just need to get them on board. It’s a long journey for most. And you know how these WRs are…a little touchy from time to time, haha. Elwood: For sure. (Said WR) just got offered, and I know several other highly-rated recruits like ND, too. (Said ATH) can play WR, as well. Some serious talent out there at WR! Hood: Yeah, they’re all over the place! Elwood: So, speaking of other recruits, how often did other players mention “Roll Toilet” to you at the Rivals camp? Hood: Hahahahahahahaha, a lot, man. We had a great time with it. Everyone there was real cool. Jake: I can’t imagine too many people being upset about that. The ND coaches were probably secretly thrilled, too! Fritz: You definitely have to enjoy the whole process and have some fun with it. Talk about the legacy you want the Golden Army class to leave behind after you all have graduated. Hood: We want to be the class that got the ring. Hood: Win one first. You play to win the game…one season at a time. Elwood: I like that. Throwing some Herm Edwards at us. Jake: Any legacy off the field? Hood: Roll Toilet = off-the-field-legacy complete. Haha, just kidding. Seriously, though. I’m just going to stay true to myself. Nothing more, nothing less. I’m going to aim for greatness and let the cards do what they will. It’s all in God’s hands. Jake: Certainly good goals to have. Notre Dame has recruited some serious talent in this class and last class to ensure winning the line of scrimmage. How excited are you to be able to run behind guys like Nelson, Bars, Byrne, and Mustipher? Hood: Lineman? Man, I L-O-V-E linemen! They are my lifeblood. Jake: Their talent makes your job 100 times easier. Mix that with your talent…yikes, man! Hood: I don’t really know them well yet, but I really love my linemen. They’re the ones who make me look good. I mean, I’d take a bullet for my line. Fritz: For sure. They free you up to get to that second level, and then you can just let your speed and power take over from there. Elwood: I don’t want guys like Clowney running at me…ever. What college or pro player do you see yourself similar to? Who do you try to emulate? Hood: Gosh, I don’t know. I just run. I don’t try to copy; I just try to be great. I mean, no one’s ever going to be like me but myself, so I don’t want to compare myself to anyone either. Like, Barry, Herschel, Emmitt…those guys are themselves. Elwood: So, instead of being the next “whoever,” you just want to be the first Elijah Hood. I get ya. **Next question is from fan, Martin Diaz, who also won our contest**: What non-football place or thing did you like most about campus? Hood: Food. I love to eat, and they always bring good food to the football recruits. Hood: Hahahaha. I’m just saying, when I started early on, South Carolina had some BBQ that made you want to commit then and there. It was banging! Elwood: South Carolina does have some serious BBQ. Hood: So serious! Clemson threw down, as well. Man, got me all hungry now! Elwood: Ha, anything else you want to add for ND Nation? Hood: Hey, y’all pay for my scholarship, I love you! I’m going to be in South Bend this weekend. Going to have a blast with the fellas. Jake: Can’t wait for you to suit up, Elijah. Stay safe this summer and good luck this next school year!